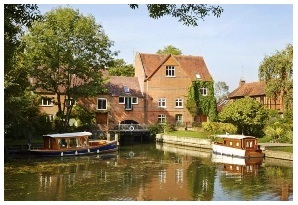 Whitchurch-on-Thames is a picturesque South Oxfordshire village with a population of about 800, lying within the Chilterns Area of Outstanding Natural Beauty. Most of the village is designated as a Conservation Area. We have an ancient church, a thriving primary school and two welcoming pubs. 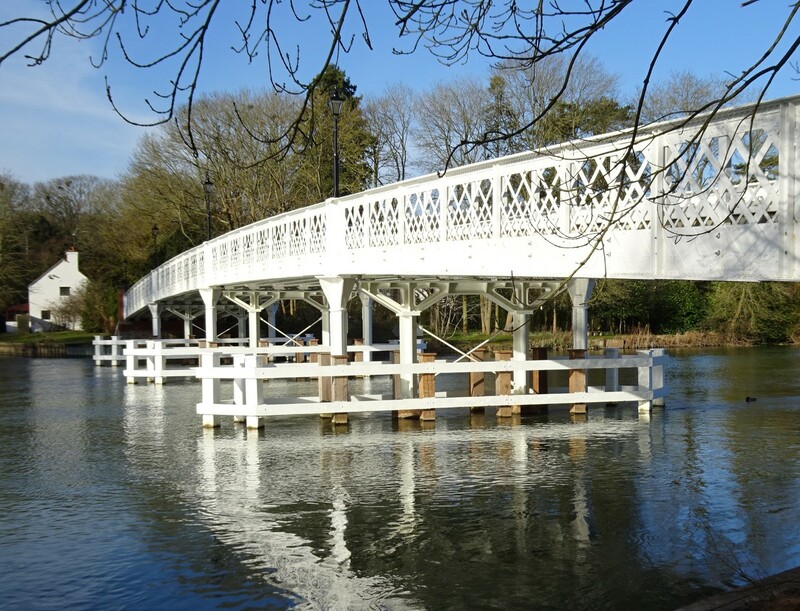 Our village is linked by a toll bridge across the River Thames to the shops and trains of Pangbourne in Berkshire. Since 1792 there has been a toll bridge across the Thames, linking Whitchurch-on-Thames in Oxfordshire with Pangbourne in Berkshire. The bridge that was built in 1902 was the third on the site and was Grade II listed. Between October 2013 and September 2014 the structure was completely rebuilt. The white lattice girders and pier columns from 1902 were incorporated in the new design to preserve the appearance of the bridge. For more information about the bridge reconstruction project see this page of the Whitchurch Web. The bridge is owned and operated by the privately owned Whitchurch Bridge Company under Acts of Parliament of 1792 and 1988. The company's website provides full information. 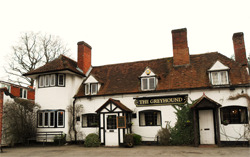 A warm welcome awaits you in the village's two pubs, The Ferryboat and the Greyhound. 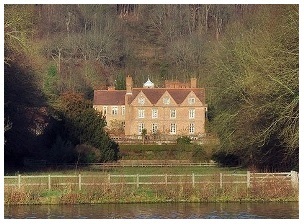 The privately-owned Hardwick Estate is set in woodlands leading down to the Thames on the eastern side of Whitchurch. The history, information about how the farm is run organically today, events at Hardwick House are all detailed in their website. Our Iron Age predecessors felt the need to establish a defended area on the chalk hills to the north of Hardwick Road. Traces of the perimeter ramparts can still be made out above the slopes now grazed by alpacas. Find out more here. In fields on both sides of Hardwick Road large numbers of alpacas can be seen. 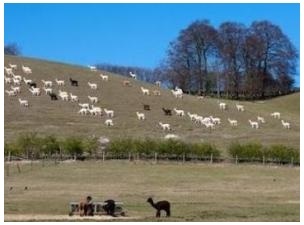 Bozedown Alpacas, founded in 1989, is one of the largest alpaca breeding and stud centres in the country. Installed in 2004, the Maze can be found at the eastern end of the village beside Hardwick Road. 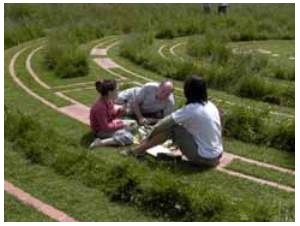 Planted with thyme and overlooked by a sundial, this is a haven for wildlife and picnickers. 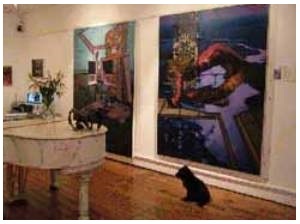 In the High Street, the village shop of earlier times is now Modern Artists Gallery and has a display of contemporary art on two floors. 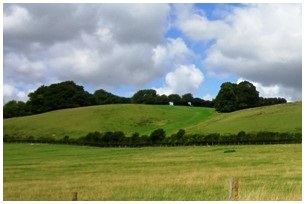 The scenic Hartslock Bridleway links Whitchurch with Goring. This article describes its ancient role as the Tuddingway and tells the story of new steps on a slippery slope. There is also an article by Pat Preece, published in Oxfordshire Local History in 2006. Anna Szczeponek arrived in Whitchurch shortly after World War Two as the young child of Polish refugee parents and has lived here ever since. 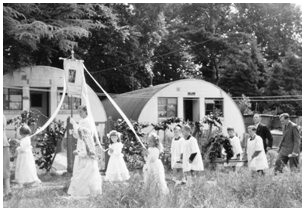 She describes the friendly community life among the Nissen huts of the Coombe Park refugee camp. One of the striking features of Whitchurch High Street is the variety of brick walls. These include several elegant bell mouth entrances. Read about them here. An ancient watermill through which a portion of the Thames flow has passed for over 900 years can be seen from the toll bridge. It provided power to grind corn and produce flour. More about the mill here. Whitchurch Lock is one of forty-five locks on the Thames. 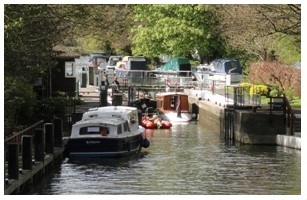 Sadly, it is thought to be the only lock on the Thames that cannot be accessed on foot, only by boat!